The number of people infected with Ebola in western Sierra Leone is increasing to more than 20 deaths daily, according to government estimates. Forty-nine new cases of were confirmed on Monday in two Ebola zones in and around the capital Freetown, the National Ebola Response Center reported on Tuesday. There are 851 total confirmed cases in the two zones, called Western Area Urban and Western Area Rural, the centre said. The Ebola outbreak previously primarily affected eastern Sierra Leone. Claude Kamanda, a lawmaker who represents a western area, told local newspaper Politico that more than 20 deaths are being reported daily, and authorities are struggling to keep up with the collection of corpses from homes in the area. Authorities say the rise in the number of cases in the west can be attributed to the movement of people from the interior of the country to Waterloo, which is the gateway to Freetown, the capital. In response to the increased number of cases, authorities have quarantined Waterloo, in Western Area Rural, a local newspaper reported. “The growing fear has left the public with no choice but to call on the government for Waterloo to be quarantined as was done to other places including Kailahun, Kenema, Bombali, Port Loko and Moyamba districts,” the Exclusive newspaper said. The World Food Programme (WFP) delivered emergency food rations to people in the area over the weekend. In the west African nations of Sierra Leone, Liberia and Guinea – where the outbreak first began 10 months ago – Ebola cases have risen sharply with the death toll exceeding 4,500, according to World Health Organisation estimates. Some cases have also emerged in the United States and Spain. Denial from community leaders and mismanagement of the response to the crisis have been blamed for failures in tackling the outbreak. With the number of cases mounting, health workers have struggled to bring Ebola patients into clinics and hospitals for treatment. Last week a meeting of international health officials voted in favour of treating people in their homes by providing them with painkillers, protective gloves and rehydration fluid. The timely collection of highly infectious corpses is an important part of attempts to contain the outbreak. 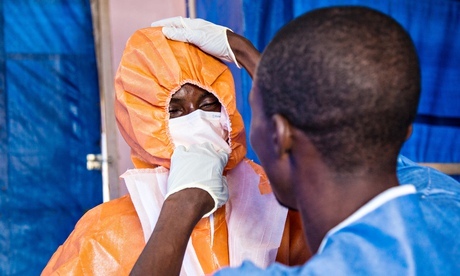 Ebola was declared an international health emergency earlier this year. There have been three confirmed cases in the US, and one in Spain. Several airlines have grounded flights to affected west African countries. A programme of screening for passengers with Ebola-like symptoms began at London’s Heathrow airport last week. Gatwick followed suit on Monday, and the Eurostar terminal at St Pancras station is expected to start soon. On Tuesday Rwanda’s ministry of health singled out passengers arriving from all five affected countries, saying they will have their temperatures taken upon arrival, and if they are found to have a fever, he or she will be denied entry. According to the CDC, signs of infection include a temperature in excess of 38.6C, as well as additional symptoms such as headache, muscle pain, vomiting and diarrhoea. Rwanda’s health ministry said that even if a passenger exhibits no signs of fever, they must still report their health condition daily to authorities. Ebola is believed to have claimed the lives of eight people in Nigeria earlier this year. After six weeks without a new case of the virus, however, it was declared Ebola-free on Monday after launching a very successful public health policy which could serve as a model for the rest of the world. Posted on 21st October 2014 by newsafrica. This entry was posted in Africa, Ebola, Health, Sierra Leone. Bookmark the permalink.